Embark on a Parisian romance with vintage bronze charms--Eiffel tower and love letter a freshwater pearl topped with a deep red Swarovski crystal drop and suspended from a delicate vintage bronze chain. Finished adjacent to the lobster clasp edged with additional Swarovski crystals. Click here to see/buy on Etsy! Click here https://www.etsy.com/listing/150782860/red-crystal-drop-vintage-bronze-earrings for matching earrings. Like sunny yellow? You're going to Love our Citrine Radiance adjustable bracelet in vintage bronze with Czech glass and Swarovski Crystals thrown in for extra bling. Citrine beads are capped with vintage bronze filigree bead caps for an extra accent. Genuine citrine semiprecious gemstones are alternated with tiny czech glass beads and wire wrapped to an adjustable vintage bronze link chain and lobster clasp. Bracelet actually measures almost 9 inches, but for my standard 7 inch wrist the lobster clasp easily fastened leaving a little more than an inch of dangle. If you need this longer, convo me and I'll add a longer chain. Click here to buy on Etsy.Click here for matching earrings. And here for a coordinating skinny chain necklace. I can't believe how fast time flies...here we are gearing up for my third annual LaMesa Oktoberfest next weekend! Lots of new skinny chains to share with you that haven't even been posted yet. And...a rack full of new earrings. Please come by the booth to say hello. And just for showing on your smart phone that you're following Magpie on ETSY www.etsy.com/shop/magpiemadnessjewelry we'll knock $1 off your purchase! Please forward this page to all your friends/family...let's build the love...for SHINY THINGS. Soft and feminine with antiqued copper metal alloy chain and findings with a Swarovski Pink Coral Pearl Pendant and an antiqued style faceted fire polished Czech glass soft pink accent bead. The chain is finished with 3mm Swarovski pearls adjacent to the lobster clasp. The antiqued copper chain is a nickel and lead free metal alloy! One of my most frequently worn stylish necklace styles. Pink Coral is wire wrapped on top of the pendant and has a darling fire polished czech glass dangle. Necklace is 27 inches long! Shown in this picture with Pink Coral earrings. See https://www.etsy.com/listing/162292069/pink-coral-swarovski-pearl-pendant to buy on Esty. Soft and feminine with antiqued copper metal alloy, antiqued copper findings, an 8mm Swarovski Pink Coral Pearl is wire wrapped with copper wire then (shown here) attached to a 2 inch antiqued copper kidney wire. We then added a side dangle...a Czech Fire Polished pale pink crystal topped with a daisy spacer and Swarovski pearl. With the 2 inch kidney wire, these wear almost 2.5 inches long. See my Etsy shop https://www.etsy.com/listing/162292977/pink-coral-swarovski-pearl-antiqued to purchase coordinating earrings. Headed up to Northern Cali for a week or so, fresh posts to follow. Enjoy! If you see something you want, email Magpie and I'll make sure it's available for you when I return. In need of relaxation, rejuvenation and inspiration! These copper and olive green tones are reminiscent of a curly red-headed young girl saucily replying to her suitors, green eyes flashing! A glossy, smooth green 15mm coin pearl topped with a daisy spacer and copper Swarovski crystal falls from an antiqued copper oval. Chain is antiqued copper and measures 28 inches to the pendant, which falls almost two more inches. 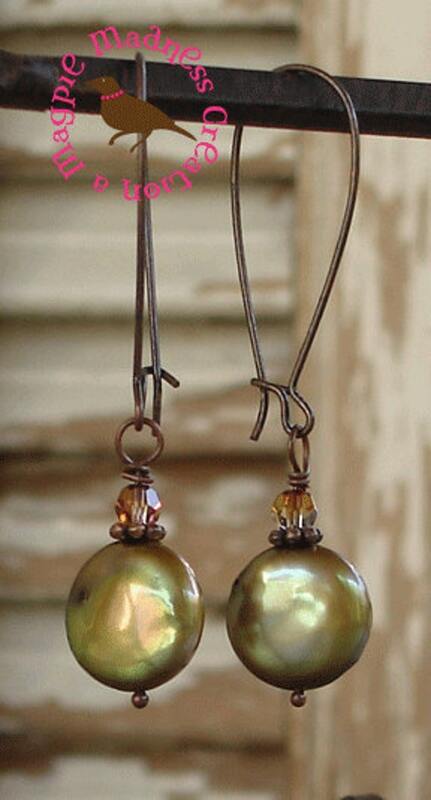 Coordinating earrings in the same pearls, crystal and antiqued copper kidney wires are 2 inches long. Necklace is $23 and Earrings $13 (sold here together but email me if you want just the necklace). Glossy pure white 15mm coin pearls (these are really nice!) are capped with Swarovski crystals and simply wired in Antiqued Silver to Antiqued Silver Lever-back ear wires. Simple. Graceful. Will go with anything for a classic statement of grace and elegance. Classic, feminine statement of elegance and style. Click here to order from Etsy. This gorgeous Smoke Quartz pendant is suspended from 30.5 inches of antiqued brass chain (pendant falls an additional 2 inches). I topped the quartz stone with vintage bronze filigree accents and a Swarovski crystal. The necklace chain is finished by the lobster clasp with tiny swarovski bicone crystals. Each pendant stone is slightly different in natural variations. I can make several more, but don't wait too long. I'm taking all my skinny chains to Oktoberfest soon. Do let me know if you want it shortened or lengthened.To buy on Etsy now, click here. Feel the frothy lace gathered at the wrists and ankles...in the Victorian times a proper lady was bedecked with lace and layers and layers of fine spun garments. It must have taken an eternity just to undress for bed. No wonder so many of the upper crust had personal ladies maids. Our Old Lace, however, is much more simple. Golden wheat colored coin pearls, champagne colored czech glass crystal beads, vintage brass finished connectors and links, and a pineapple quartz teardrop right at the bottom of the Y. Fits close to the neck at 16.5 inches in length. I added a two inch extender chain. If that's not enough, text/email me and I'll make it longer (or can easily work in a few extra beads for added length). Click here to buy on my Etsy shop. Or contact me directly.